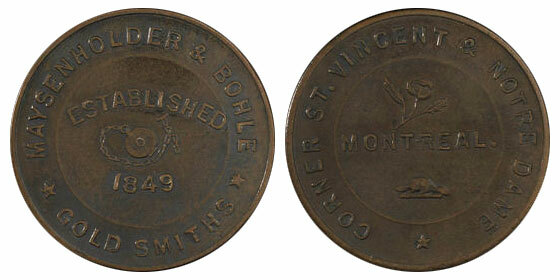 This firm was established in Montreal in 1849, and its dissolution not very long afterwards, indicates why the coin was not issued in any large quantity. According to one of the sons of Mr. Maysenholder, born in 1857, also a jeweller, residing in Montreal, remembered that an employee of his father use these dies to strike sufficient of these coins to pay for his drinks. In the year 1886, Mr. A. Desroches discovered seven of these coins, and a little later 24 others, making 31 in all, besides seven pieces struck only on one side. He has not been able to find any trace of the dies. Mr. Desroches who, himself, has given these facts, guarantees their authenticity.. His reason for not sooner communicating them to the public was, that he might secure all these coins that were to be had, and exchange or sell them to the best advantage. Mr. Desroches has disposed of the whole of the find at good prices. Text : Maysenholder & Bohle - Gold Smiths - Established 1849. Corner St. Vincent & Notre Dame Montreal.